I've been wearing eyeglasses since I was little, so that's probably why I was attracted to the idea of making a quilted eyeglass case. But even if your friends don't wear glasses, I'm betting they wear sunglasses from time to time, or that they "enhance" their vision with drug store cheaters/readers. 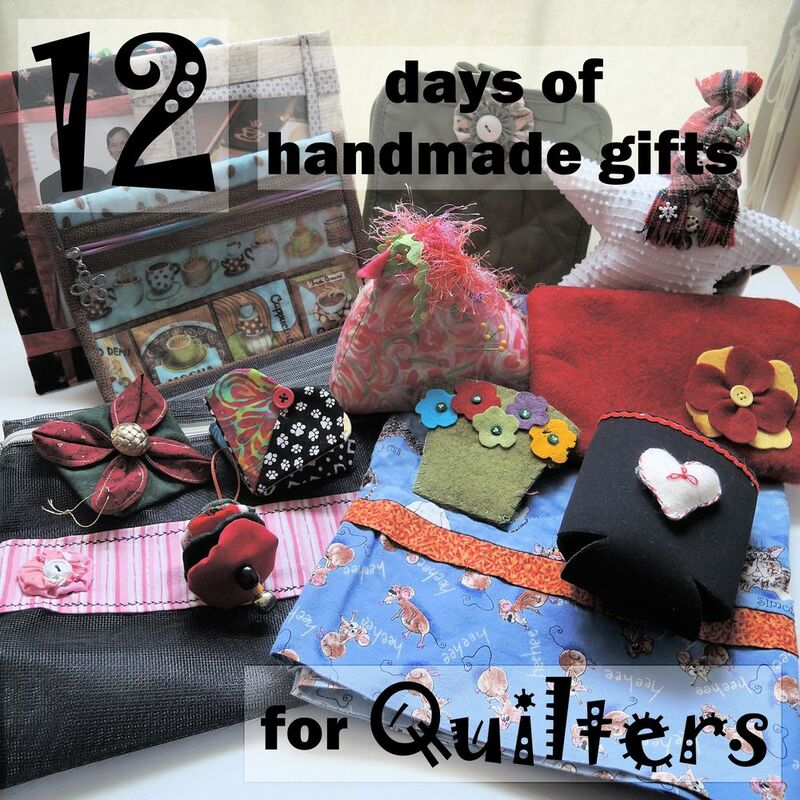 No matter what the reason, there's a good chance that someone on your Christmas list would appreciate today's feature in my 12 Days of Christmas Gifts series: a quilted eyeglass case. Arrange the seven 1-1/2” squares as you like, then sew them together in a long strip. Press seams in the same direction. Sew the 1” Outer fabric strip to one side of the Accent strip, and press towards the Outer fabric. The Outer fabric strip will be a bit smaller—just center the Accent strip on it and sew. Trim the unit even with the edges if the Outer fabric. Sew the 7-1/2”x7-1/4” Outer fabric rectangle to the other side of the Accent strip. Again, press towards the Outer fabric. Lay the batting/felt, the Inner fabric face up, then the Outer fabric face down. Pin. Round the edges of the flap by tracing around a small cup or other round object and then trimming all layers as shown. Measure down 3-1/4” and 1/4” in on each side and mark with a dot. Sew the flap inward from the edge of the fabric towards the first dot, then around the edge of the flap to the other dot and straight out from the dot to the edge of the fabric. Measure 1-1/4” down from top edge and 1-1/2” in from the right edge and place a dot. Draw a diagonal line connecting the dot to the corner. Repeat for other corner—placing your dot and drawing a line connecting it to the corner. Connect the two lower points with a horizontal line. Draw a line from each of the corners, 1/4” in from the side and 1” down from the top. Continue the line straight out to the side as shown. 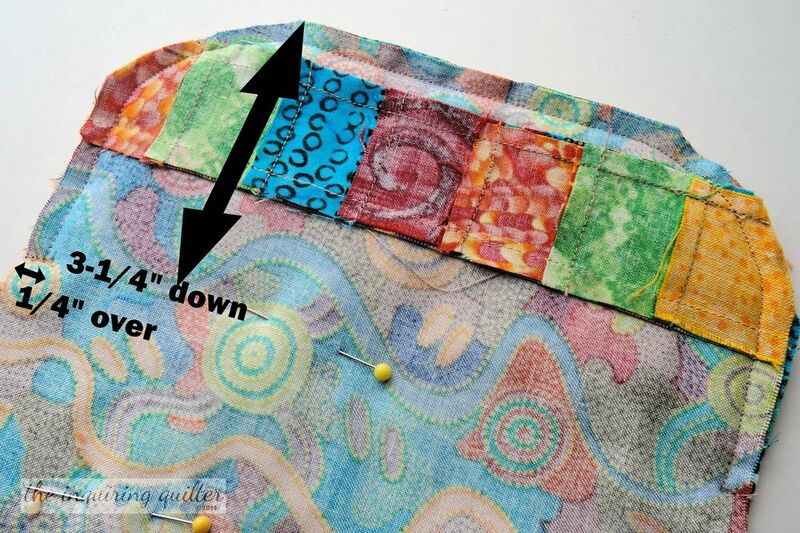 Sew the Inner flap along this line, backstitching at the beginning and end of the seam. Trim corners. Trim the seam where needed to 1/4”. Clip inward points. Flip both ends right side out and press. Fold up the bottom, overlapping the body by 2-1/2”. 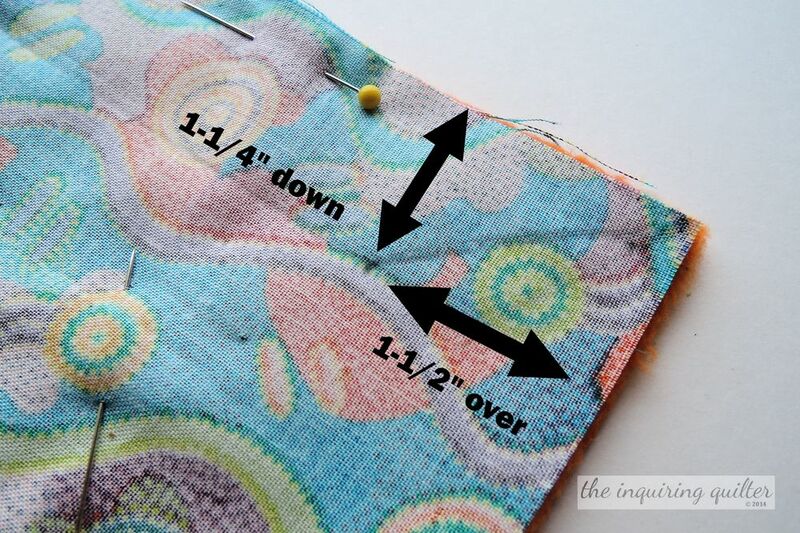 Sew the sides using a 1/8” seam. The seams are now enclosed in a French seam. Pin the eyeglass case with safety pins as you would a large quilt. Quilt the eyeglass case. I quilted the Accent strip in the ditch, then quilted each square with a curvy X.
Sew the hook side of the Vecro to the front of the eyeglass case, and the loop side to the back side as shown. Although this is a bit more complex than some of the other items featured in my 12 Days of Christmas Gifts series, I think you will agree that it's worth the extra effort.